One of the problems with responding to medical evidence letters is that GPs are not specifically paid for this work. My last blog looked at the decision taken by the Sheffield Local Medical Committee to advise its members that they did not need to respond to requests by local Citizens Advice for help with medical evidence when people were appealing refusals by DWP to grant Personal Independence Payments or Employment Support Allowance. That blog led to some good conversations on twitter with a number of GPs. Dr Murphy has published a piece on her blog that sets out in straightforward terms what a GP needs to do with regards to evidence letters . It struck me how isolated GPs are – there really was a feeling that they are being left to work this issue out for themselves with little support from bodies with a wider systemic responsibility. This certainly leaves them feeling ignored and in some cases resentful. I think that there is a failure by the RCGP and by NHS England (and of course DWP) to recognise this is an important issue. Nothing in the GP Five Year Forward View! I think that local Citizens Advice can make it easier for GPs by offering simple templates that are more likely to succeed at DWP tribunals. 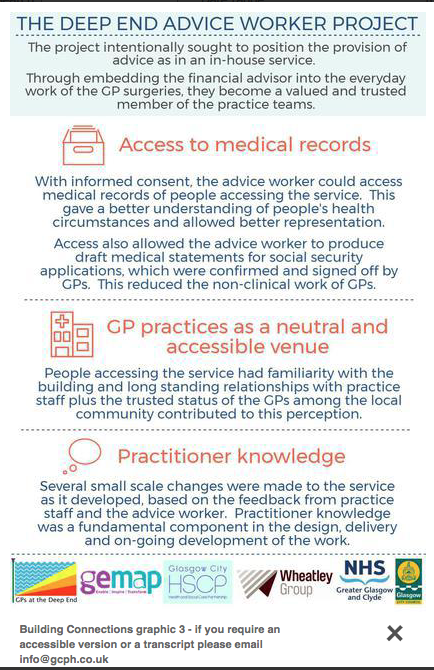 Similarly GPs can help by giving Citizens Advice access to patient data – as Dan Hopewell from Bromley By Bow explained in his comments on my earlier blog when he drew attention to an example from the Glasgow Deep End Group. 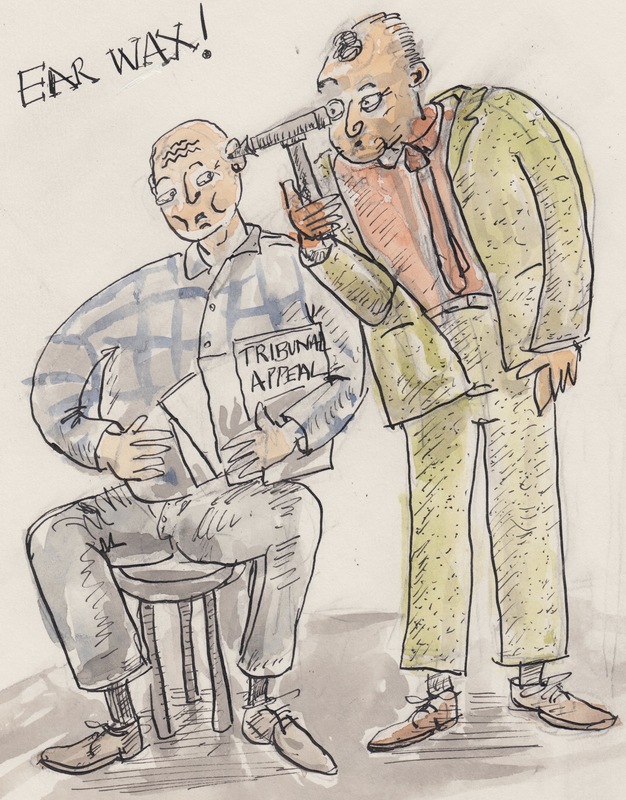 We urgently need more collaboration here – we cannot rely on biased advice from Maximus and simply advising GPs who want to help their patients to ignore Citizens Advice requests for evidence letters – does not help GPs or their patients! Once again I think you have hit the nail on the head Mark! Apart from this being the right thing to do, the business and clinical case is clear: supporting people to self care makes all sort of sense, anything that ‘disables’ people from doing so, like financial meltdown is contraindicated. I look on this service as preventative intervention to support health and well-being. I take the point GPs make about their workload, the system being dysfunctional etc. but a person centred approach, putting the patients needs first surely means this is a ‘must do’ for GPs even if it’s not in the contract. I’m not sure that GPs and LMCs who say they won’t or can’t do this understand the reputational damage this causes to their profession? Cheers NB – agree – what we need are sophisticated tactical responses that build alliances across services that are directly affected who see the damage that DWP policies do to people. These comments remind me of the story of the senior librarian who left her job to become a nun because she felt that often she was spending her time doing ” acts of kindness ” that were not recognised by her manager. I believe it to be true that much of the high regard people have for us as GPs is that for decades we have been doing “” acts of kindness “. . This. aspect of GP practice needs much more consideration by Government and the BMA . Failure to do so will only lead to a further decline in the number of doctors applying to train to be GPs. Assessor don’t even look at the evidence! Claimants already pay for medical evidence, ours charge £16 per letter! Some years ago we had a great conversation with our LMC about this and although it didn’t progress the issue as much as we had hoped it did help enormously with understanding each others problems. With more advice being commissioned to work with / in surgeries collaboration seem to be the answer in increasing understanding and saving precious time for all. Yes . I informed you of the link before i had chance to see it myself. I find it hard to believe there’s no linking with poverty. My thoughts are that the link to poverty and the benefit to health and wellbeing of advice, in particular welfare benefit advice, is so well documented that the conversation needs to be about how that advice is funded and how it’s delivered. For instance Manchester’s hotline approach versus advice based in a surgery and only open to patients on that specific surgeries list.